Applicability of the K/BxN pathogenic pathway to rheumatoid arthritis? A revival of the B cell paradigm for rheumatoid arthritis pathogenesis? Dominant paradigms for the understanding of rheumatoid arthritis (RA) pathogenesis have changed over the years. A predominant role of B lymphocytes, and perhaps of the rheumatoid factor they produced, was initially invoked. In more recent years, recognition of antigens in the joint by T cells sparking an inflammatory cascade has been a more favored interpretation. Here, we re-examine some of the arguments that underpin this proposed role of joint T cells, in light of recent results from transgenic mice in which a self-reactive T-cell receptor provokes disease, but from outside the joint and indirectly via B lymphocytes and immunoglobulins. Favoured explanations for the pathogenesis of RA have changed several times over the past four decades, and our understanding of this mysterious disease remains nebulous. Today, few dispute that the effector phase involves angiogenesis, chemotaxis and activation of monocytic cells, anarchic proliferation of synoviocytes, and the release of a witch's brew of inflammatory cytokines, proteases and glycolytic enzymes, which ultimately results in cartilage and bone destruction. The tantalizing unanswered questions relate to the upstream steps that initiate this process; we have many clues, but little definitive information. The role of immunological perturbations in starting the arthritis process seems reasonably established, but there have been several changes in the reigning paradigm to explain how autoimmune deviation provokes inflammation and destruction of the joint. In the 1960s, a series of immunochemical findings placed RA in the realm of B lymphocyte disorders, via their immunoglobulin products. These findings include the following: the frequent detection of autoantibodies, in particular of rheumatoid factor (RF; anti-immunoglobulin G); the presence of immune complexes and of reduced complement levels in the joint; and the observation of immunoglobulin deposits and of intracytoplasmic inclusions, composed of immunoglobulins and complement, in phagocytes. These findings suggested a paradigm according to which local immune responses, taking place in the joint and directed against joint components, produce arthritogenic autoantibodies . These immunoglobulins would then complex with their specific antigen, activating resident phagocytic cells of the synovial lining, and starting the complement cascade. Soluble mediators produced as a result would attract more monocytic cells and stimulate anarchic proliferation of synoviocytes. The presence in RA synovium of plasma cells and B lymphocytes organized in follicle-like formations gave a cellular footing to this idea. Some investigators (eg Ohno and Cooke ) argued for a related paradigm by which a microbe-initiated systemic B-cell response resulted in an immune complex disease. During the ensuing 20 years, however, these notions changed, with B cells losing precedence to T cells as the principal agents provocateurs in RA. The relevance of RF to RA pathogenesis became rather suspect, because RF is absent in a substantial proportion of RA patients and, conversely, high-affinity somatically mutated RF was found in many other instances of chronic immune stimulation . Other autoantibodies were even more inconstant. Furthermore, no evidence for directly pathogenic antibodies in RA patients was obtained [4,5]. Several arguments [6,7,8] gave credence to an alternative paradigm that is centred on T cells; synovitis was no longer thought to be induced by antibodies, but rather by a cell-mediated process akin to delayed-type hypersensitivity, involving the local activation of T cells by antigen-presenting cells. This stimulation released inflammatory cytokines, which activated synoviocytes and monocytes, initiating the monocyte-mediated destructive process described above. Although there was some debate as to the relative roles of T and inflammatory cells once the disease had started [6,9], these views all postulated that joint autoantigen recognition by T cells, and not by antibodies, was at the root of RA (Fig. 1a). The linkage that was discovered between RA and particular major histocompatibility complex (MHC) class II haplotypes , with sequence motifs shared between DRβ alleles linked to susceptibility . As the main function of MHC class II molecules is to present peptides to T cells, this implied a determining role for the presentation of particular peptides. The importance of T cells in animal models of RA, such as collagen-induced arthritis (CIA), T-cell populations or clones being able to provoke disease in normal mice. The presence of T lymphocytes in synovial tissue and fluid. The activated/memory phenotype of these T cells, suggesting that they are involved in a local immune response . Reports of oligoclonal expansion of these infiltrating T cells [13,14], implying reactivity to a restricted set of antigenic peptides or to a superantigen. The beneficial effect of therapies that target T cells, such as treatment with anti-CD4 monoclonal antibodies . This 'T-cell centric' paradigm was conceptually similar to the favored interpretations of other T-cell-mediated autoimmune diseases, such as type I (insulin dependent) diabetes mellitus, in which autoantigen recognition by T cells appears to be the primary trigger of tissue destruction. It led to proposals of therapeutic strategies designed to block T-cell receptors (TCRs) that are reactive to joint antigens . Issues remaining at the forefront were to identify the joint-specific T cell antigens in order to pinpoint the TCR V regions used in their recognition, why these autoantigens are uniquely recognized in diseased individuals, and to understand the adhesive interactions that concentrate T cells in the joint. Models of T cell invovement in rheumatoid arthritis (RA). (a) The 'classical' model. T cells within the joint recognize fragments of autoantigens presented by local dendritic cells (DCs). As a consequence they produce inflammatory cytokines that directly affect chondrocytes, but mainly prime monocytes and synoviocytes (either fibroblastic or macrophage-like) to produce more substantial amounts of monokines (eg tumor necrosis factor), proteases or glycosidases to effect cartilage destruction and bone remodeling. 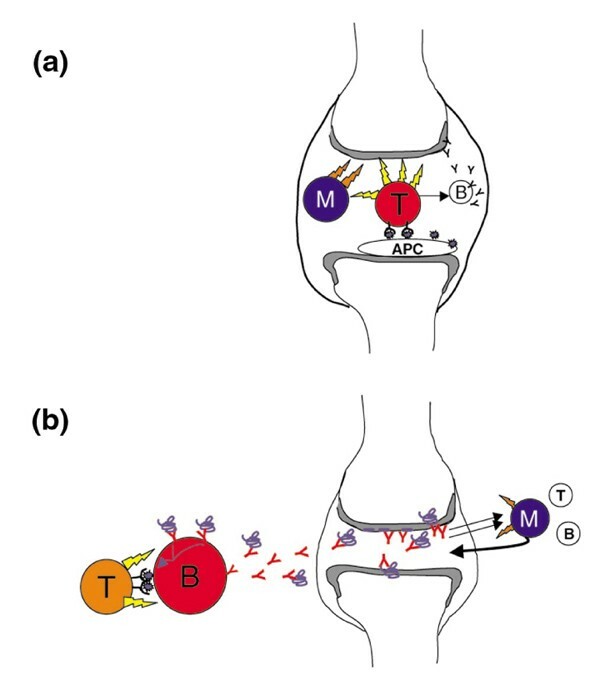 In this view, there may be local activation of B cells to produce immunoglobulins directed against joint-specific structures, but this is an ancillary pathway. (b) In this model, T-cell activation occurs outside the joint, and is not necessarily caused by joint-specific peptides. The relevant mode of antigen presentation is by B cells, which have picked up rare antigen molecules via their surface immunoglobulin, and are thus preferentially helped. The arthritogenic immunoglobulin they produce (in isolation or in complexed form) then diffuses to the joint. In this locale, immunoglobulin binding or activation by immune complexes provokes the release of chemokines, attracting and priming monocytes to elicit cartilage and joint destruction (and secondary release of B and T cells). We have recently described a transgenic mouse model of inflammatory arthritis that is quite reminiscent of RA [17,18]. Even though this model has T-cell autoreactivity at its root, the pathogenic process follows a conceptually different path to that described above. Thus, it might be interesting to re-evaluate the interpretations of RA pathogenesis in this light. The K/BxN model [17,18] has been reviewed in detail elsewhere [19,20], and it is not our intent to describe it at length here. Briefly, disease is provoked by a self-reactive TCR that is encoded by cointegrated TCR-α and TCR-β transgenes. This TCR recognizes a peptide that is derived from a ubiquitous self-antigen [glucose-6-phosphate isomerase (GPI) , and provokes the differentiation and proliferation of B cells with surface immunoglobulin that reacts against the same molecule. The autoantibodies, in turn, are directly pathogenic upon transfer, inducing arthritis even in the complete absence of any lymphocytes in the joint. The synovitis induced by the arthritogenic antibodies involves the initiation of an inflammatory process via complement and Fcγ receptor pathways (Ji H, unpublished data). The pathogenic cascade operating in these mice is shown in Figure 1b. A few points that differentiate it from most previous models of RA should be stressed: reactivity is against a ubiquitous autoantigen, that has no known joint specificity; and T cells initiate disease by coaxing B cells to produce pathogenic immunglobulins, but this takes place outside the joint. The disease in K/BxN mice does differ somewhat from that in RA patients (eg in the precise distribution of the joints involved, the degree of aggressiveness and the extent of remodeling that follows destruction). One should bear in mind, however, that few humans are likely to have the skewed repertoire of a TCR transgenic mouse, and that mouse and human locomotor physiologies are different. It seems of less value to debate the significance of distal interphalangial joint inflammation or whether tail inflammation in mice has a correlate in humans than to ask whether the mechanism that operates in the transgenic animals might also, in a generic manner, underlie disease in humans. Let us, then, reconsider the above-listed arguments in support of the notion that T cells that recognize antigens in the joint drive effector functions in RA. The linkage to certain MHC II alleles. This is clearly a strong argument for T-cell involvement, but such a linkage is equally compatible with MHC class II-restricted responses by CD4+ cells that occur outside the joint, as in K/BxN mice. It may be worth stressing that arthritis in the transgenic animals exhibits a stringent requirement for a particular MHC class II molecule to guide T-B cell collaboration . The role of T cells in CIA. The disease that is induced in rodents immunized with articular collagen can indeed be transferred to normal animals by T-cell populations or clones derived from responding mice (as from K/BxN mice). However, there is no compelling evidence that transferred T cells need act locally, rather than by stimulating the production of autoantibodies in draining lymph nodes, as normally occurs when T cells help B cells. Indeed, it has been demonstrated that serum and monoclonal antibodies from mice with CIA can also induce disease in normal recipients, but not always very efficiently . The presence of T cells in RA synovial fluid and tissue.This might have been the most misleading clue; does presence necessarily imply function? Nothing indicates that T cells in RA joints, with representation that varies widely between individuals, are not mere bystanders attracted by the chemokines and the changes in adhesive properties of the vascular endothelium generated by an intense inflammatory process. The activated phenotype of joint-infiltrating T cells. Again, this is guilt by innuendo. It seems hardly likely that T lymphocytes would remain impassive in the 'swirling maelstrom of inflammatory cytokines'  of an arthritic joint. Furthermore, it is known that activated T cells are more efficient than naïve cells in their ability to migrate to nonlymphoid tissues; the activated status of T cells in RA joints might just reflect preferential recruitment also. The early reports of oligoclonal expansion of T cells in joints have not proved to be repeatable or generalizeable. Technical artifacts linked to small sample sizes ('founder effects' in reverse transcription polymerase chain reaction) have probably been a major factor in these contradictory data . Similarly, early suggestions of a high efficacy of anti-CD4 treatments have not been supported in the long run [23,24]. Interestingly, anti-CD4 therapy is only effective when administered before pathogenic antibody accumulates and inflammation begins in the K/BxN mice ; might one need to treat RA patients pre-emptively, which is not really a viable strategy. In short, some of the arguments that pointed to a pathogenic role for joint T cells are certainly open to question; others are equally applicable to a 'remote' mode of T cell implication, as in K/BxN mice. Such a scenario might also explain more readily the extra-articular manifestations of many RA patients; circulating autoantibodies that induce joint inflammation could conceivably cause lesions in connective tissue of the heart and lung as well. To a large extent, the mode of pathogenesis that emerges in the K/BxN model brings us back to the dominant 'B-cell centric' paradigms of the 1960s and 1970s. There are two important nuances, though. First is the locale of autoantibody production. The pathogenic B cells were often thought to be localized in the joint, which is consistent with the presence of activated B cells and plasma cells in RA synovium, leading to many attempts to identify dominant idiotypes or antigenic targets of immunoglobulin produced in the synovium . The 'presence does not automatically imply function' caveat evoked above also applies here, however, and these B lineage cells may just as well be innocent bystanders or partake in secondary responses, as they are in the insulitic lesions of autoimmune diabetes. That arthritis can be induced by anti-GPI antibodies opens the door to alternative explanations that are not based on immunoglobulin responses generated in the joint, or even directed against joint-specific antigens. As often pointed out by others [1,15], the blood-tissue barrier in the joint has a unique disposition, marked in particular by the absence of a basal membrane. This may help explain why responses to a ubiquitous antigen can have joint-specific consequences. The second nuance is that T cells do play a primary role in the pathogenesis of the K/BxN disease, which, after all, does stem from the expression of a TCR transgene. Of course, pathogenic B cells are known to require some help from T cells, but it was not as clear that primary autoreactivity in the T-cell compartment would be sufficient to jump-start the process, by recruiting B cells with surface immunoglobulin receptors directed against the same molecule. In the end, is the mode of arthritis pathogenesis in K/BxN mice applicable in RA patients, or more particularly to one of its forms? (The polymorphism of the disease as presently diagnosed does allow room for several modes of pathogenesis). Certainly, there is a burden of proof to identify pathogenic antibodies in serum from RA patients, and to test whether any of the known autoreactivities in RA patients  might have a pathogenic role similar to that of anti-GPI in mice. Certainly, no direct evidence has been reported for pathogenic immunoglobulins in RA [4,5], but one can easily imagine why they may have been technically difficult to identify. It will also be important to solve the riddle of how and why antibodies to a ubiquitously expressed protein can provoke joint-specific disease. Until then, the main value of the K/BxN model may be to question some of the assumptions of the paradigms that presently dominate our view of RA. We should perhaps look for pathogenic Band T cells outside the confines of the joint and joint-specific antigens. One may also wish to consider therapeutic approaches aimed at T cells more prudently; if they are indeed helping pathogenic B cells, and in particular if the isotopes of the antibodies they separate have disease significance, attempts to tinker with T-helper 1/T-helper 2 balance might prove most deleterious.